You walk slowly across a frozen lake towards a distant oval that emerges from the thick snow. It’s so cold you can see your breathe but no one around you seems to notice. They all seem excited. The top layer of ice and snow crunches as you trek forward taking in the scene. You can here the clammier of plows scrapping loudly against the ice but it is quickly drowned out by the mechanical roar of engines. Turning to your right, you take in the odd grouping of souped up race cars that don’t seem to belong on the wind torn expanse of Contoocook Lake. Their vibrant colors clash with the white of the snow. They almost make you feel warm. Welcome to this Sunday’s Jaffery ice race. It’s going to be a chilly one. As cold winter temperatures continues to rage into March, it is important to find new and exciting ways to beat the cabin fever. The most exciting way to overcome the winter blues is by attending an ice race in the Monadnock region, more specifically Jaffrey, New Hampshire. Jaffrey is home to the Jaffrey Ice Racing Association, which holds races every Sunday in the winter months (January to March), given the right temperatures and ice conditions. New England is known for its inclement weather, especially during the long cold months of winter. For those unfamiliar with New England winters, it is so cold that anything not below freezing feels like an excuse to cast off winter jackets and celebrate. These low temperatures ensure that ponds and lakes in our region, especially the smaller ones like Contoocook Lake, freeze solidly during the winter. These cold temperatures are essential to ice racing, although, the excessive amount of snow fall this season has made the maintenance of the Contoocook race track extremely difficult. 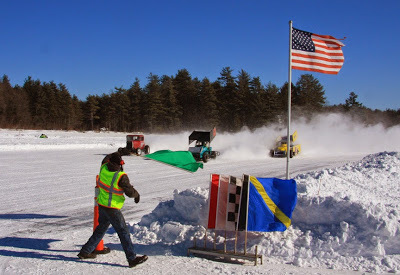 Many of those involved with the Jaffrey Ice Racing Association have worked countless hours to get the track ploughed, prepped, and ready in time for races each Sunday. While it may be frightening to some, be assured that the races are very safe. 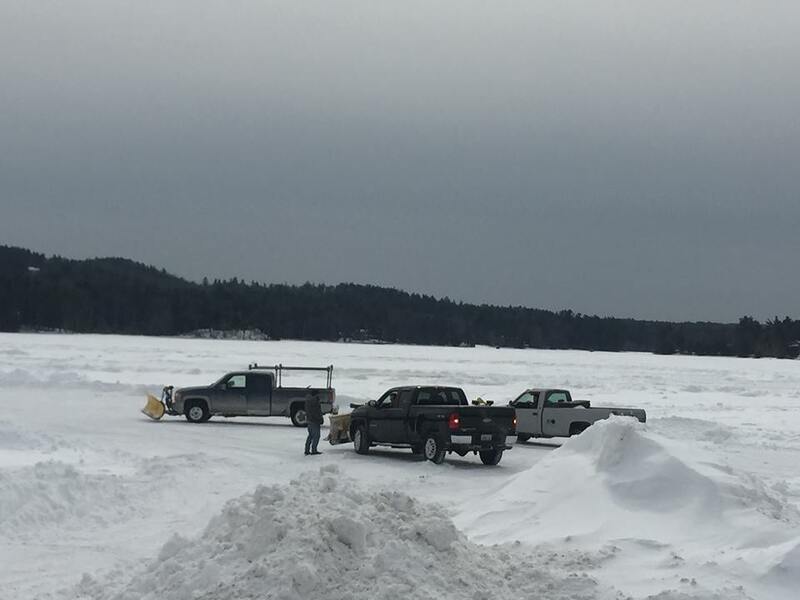 The people at Jaffrey Ice Racing Association follow strict protocols to ensure that ice conditions are optimal before every race. The ice needs to be at least 12-15 inches for an average truck to drive safely onto the ice without risk. 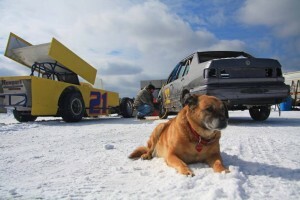 The ice races in Jaffrey consist of two main types of cars, stock cars and modifieds. For each of these two divisions, there are typically two heat races followed by a feature race. The heat races give the drivers a chance to warm up their engines up and assess how the pack is running. In addition to the two main feature races, there is also a kids division in which younger drivers are given the opportunity to test their racing skills on the ice track. The modifieds at the Jaffrey Ice Racing Association are considered, in the racing world, what is referred to as outlaw racing. The reason is because the extensive rules that governs other tracks, cars, and racers doesn’t exist at the Jaffrey Ice Racing Association. There are very few rules involved with Jaffrey Ice Racing, which brings together dirt modifieds, winged modifieds, vintage modifieds and asphalt late models. The wide variety and types of cars racing together is what makes this group so interesting to watch. 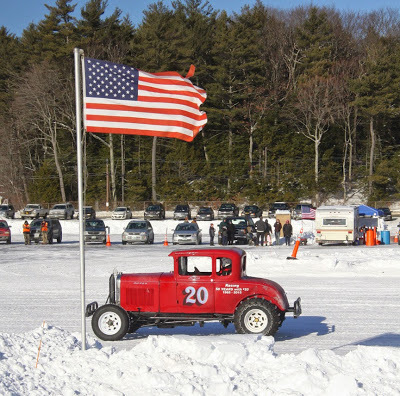 The tradition of ice racing in the Monadnock region is rich. 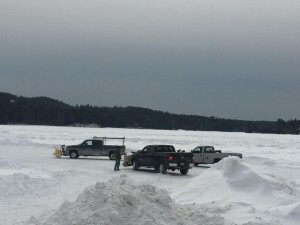 For over thirty years, the Jaffrey Ice Racing Association has been home to ice racing during the winter months.The Jaffrey Ice Racing has taken place on Contoocook Lake in the Monadnock region for over a decade. Previously, the group has raced on Swallow Hill Pond, Whitney Pond, and Northwood Lake. However, people have been strapping on winter chains and spikes to their tires and getting out on the ice to race cars for roughly fifty to sixty years. The Jaffrey Ice Racing Association is home to local living legends that have been a part of ice racing in the Monadnock region for many decades. One man, Alan Darrah, has been racing in the Monadnock region in the same car for fifty years! His 1930 Ford Model A coupe has been a fixture of the Jaffrey Ice Racing and other races around the region in Massachusetts and New Hampshire. The number 20 car, which he has been driving since 1965 has taken Darrah to many victories. In 1973 he was crowned the New England Ice Racing Champion. The amazing thing about the Jaffrey Ice Racing Association is that they are dedicated to giving back to their community. They are a non profit organization and raise money for local charities and communities organizations. 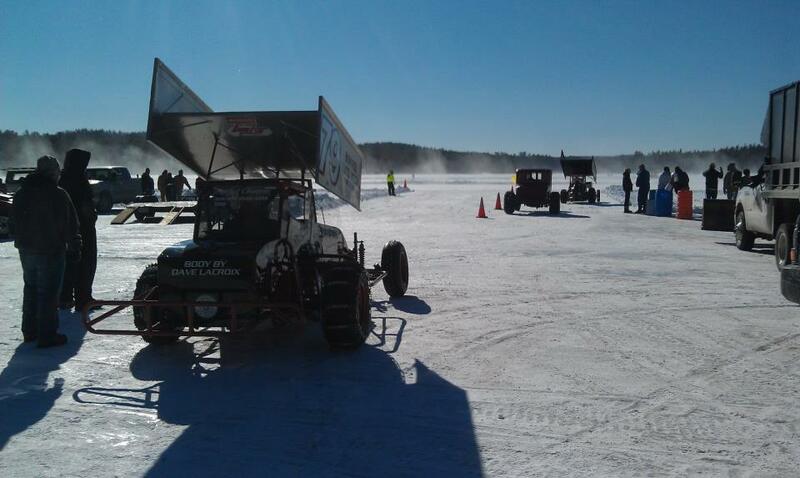 The Jaffrey Ice Racing association is able to accomplish community outreach and involvement while doing the thing that they love most, racing. The Jaffrey Ice Racing Association raises money for a number of organizations throughout their regular season. Last week February 23, they raised money for the local wounded warriors and military families. The Jaffrey Ice Racing Association is really more of a group of friends getting together to do what they love than anything else, but that doesn’t mean that they don’t get competitive with one another. Drivers are awarded trophies for their victories and drivers also get weekly bragging rights. The Jaffrey Ice Racing Association keeps track of points throughout the season to determine standings and overall season winners. Please come out and support the Jaffrey Ice Racing Association for their last few races of the year! Spectators can choose to walk onto the ice for a mere $3 or pay by car load for $10. They race every Sunday and you wouldn’t want to miss out on the opportunity to take in this spectacle.